Brachioplasty surgery aims to address upper arm skin excess by excision of skin and fatty tissue resulting in the appearance of toned upper arms. The surgery can be corrective to address excess skin which may be unsightly and can result in skin irritation, infections and issues with hygiene. The excess skin may result from weight loss following bariatric surgery, diet and exercise or following pregnancy. Brachioplasty is significant surgery. Patients need to be fully aware of the adjustment in appearance they will experience, as well as the post-operative process and surgical risks involved. Patients will need to allow one hour for their initial consultation. The aim of the pre-operative consultation is to determine the patient’s expectations of the procedure, and to communicate with the patient any potential limitations to achieving their desired goals. The surgeon will need to assess the patient in regard to the extent of excess skin, the quality of their skin, and fat deposits. Brachioplasty surgery is best considered when a patient’s weight has been stable for at least 3 months. In appropriate patients, liposuction can also be used during brachioplasty. Depending on the patient’s medical history, further consultations may be necessary to minimise complications during surgery. Diagnostic tests including blood tests may also be necessary for the Surgeon to obtain a complete assessment of bleeding tendencies and to identify a patient’s potential risk of anaesthesia. If advised by the Surgeon, it may also be necessary to cease certain medications and to avoid other medicine and supplements two weeks prior to and after surgery. It is essential that smoking ceases six weeks prior to and after surgery to minimise the risk of surgical wound complications and anaesthesia. Nicotine containing products can also affect wound healing and should be ceased two weeks prior to and after surgery. Further surgery to address these potential complications is another risk patients must be fully aware of. Risks specific to brachioplasty surgery, which improve over 18 months to two years include swelling and redness of the skin and numbness of the inner arms and forearms. Those specific risks which may require revisional surgery include asymmetry and dog-ear formation, which are contour irregularities at either end of the scar. Revisional surgery is necessary in approximately 5 per cent of patients who undergo brachioplasty surgery. It is only at the culmination of the consultation process, after having the opportunity to have questions addressed by the Surgeon, should consent to brachioplasty surgery be given. The consent process will also include discussion regarding the costs of surgery and potential revisional surgery. The Australian Medical Board strongly advises against the advertising of set prices for regulated health services. As such, NorthEast Plastic Surgery does not quote set prices for our procedures. Your surgeon can provide you with a tailored quote during your initial consultation or you can contact our clinic before your first appointment to discuss approximate costs and potential rebates. Please contact us on 03 9088 5000, or send us an online enquiry to find out more. The cost of an initial consultation with a Surgeon to discuss your procedure is $175 ($225 for weekend consultations). A portion of this cost may be claimed from Medicare if you have a referral from your GP. 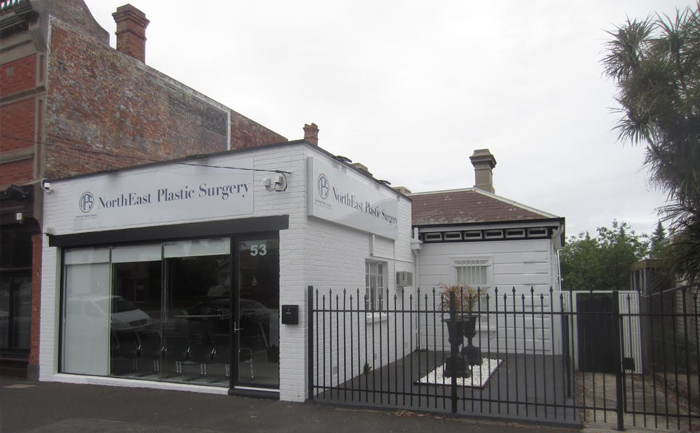 Brachioplasty is performed under general anaesthetic in an accredited hospital by NorthEast Plastic Surgery’s highly experienced surgeons. The incisions are placed on the inner aspect of the arm extending from the armpit to the elbow. The Surgeon will discuss the extent and length of the scars prior to surgery and the amount of fat and tissue to be removed to optimise the contour of the upper arm. The internal wounds are repaired with dissolving stitches. Drainage tubes are used to drain tissue fluid and blood. At the completion of surgery, a waterproof dressing and compression garment is applied, which minimises soft tissue swelling. Following monitoring in the recovery room, patients are discharged to the care of a responsible adult for 24 hours. At the time of discharge, appropriate pain medication and antibiotics will be dispensed and it is important that these be taken to minimise discomfort and potential wound complications. It is important that access to medical attention which is available by telephone if necessary. Patients should seek medical assistance if they experience a temperature over 38 degrees Celsius, bleeding to the extent that the dressings soak through with blood, pain not controlled by the medication, redness of the arm or forearm skin or any concerns related to the surgery. To minimise post-operative bruising, elevation of the arms should be maintained with pillows for seven days. In general, swelling and bruising increase over the first three to five days and improve between five to 10 days. In some instances, it may take several months for the soft tissue swelling to subside completely. During this period the sensation of the arm and forearm skin may be affected but will return to normal over a few months. During post-operative visits, the dressings will be changed as appropriate while the wounds are healing and will generally take approximately three weeks to achieve. During this period, arm movement should be kept to a minimum to encourage wound healing. Driving a motor vehicle should be avoided for two weeks. Resumptions of physical activity such as walking for exercise can commence three weeks after surgery, progressing to running and normal exercise including swimming at six weeks. It is important to avoid upper arm trauma from being knocked or hit accidentally for six weeks after surgery. Return to work can be anticipated after two to three weeks. The final result of brachioplasty surgery may not appreciated for many months as the inner arm scar can be unpredictable and will be visible when the arm is raised for up to 18 months after surgery. During the patient’s post-operative consultations, they will be given strategies on swelling and scar management strategies, such as massage, taping and silicone gel sheeting. The aim of these strategies is to reduce the thickness of scarring and soft tissue swelling, with the aim of achieving an optimal result as effectively as possible.